Hay House Inc., 9781401928452, 384pp. 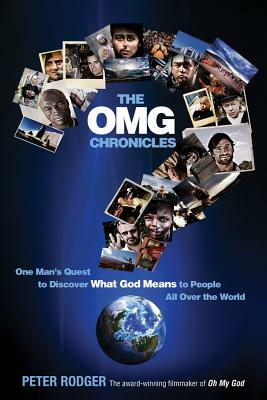 In 2006, frustrated with religious turmoil, fanaticism, and fundamentalism, filmmaker Peter Rodger set out on a quest across 23 countries to shoot the epic nonfiction motion picture Oh My God in an attempt to understand what the concept of God meant to people in all walks of life. This book chronicles Peter’s extraordinary adventure as he circled the globe, asking an amazing array of characters the simple (but not-so-simple) question: "What is God?" This is a story of overcoming challenges, as well as a unique travelogue and social snapshot. It delves into the pain of persevering in times of trouble and is also a testament to adhering to one’s own convictions. Philosophical, searching, funny, and very personal, this work will make you laugh out loud, and at other times make you cry. It is devoid of theology, but touches faith on both religious and nonreligious levels. It is objective, yet there are many opinions. Above all, it is a chance to be whisked away from the comfort of your own home to visit places and people, famous and not; and absorb their profound, irreverent, blasphemous, spiritual musings . . . on an age-old query. Their words will stir up passion, curiosity, self-examination, and wild imagination. Oh My God! Prepare for the ride. After completing his education at England’s Maidstone College of Art, Peter Rodger’s skill with the lens made him one of the most sought-after talents in the European and United States advertising industry, shooting numerous car, clothing, and cosmetics companies’ print and commercial campaigns in over 40 different countries. Peter has exhibited his fine-art work all over the world and has won numerous awards for his filmed work, including several Telly Awards. He has also penned seven screenplays, including Bystander, Comfort of the Storm, and Publication Day, which are in development. After two and a half years of filming across 23 countries, Peter has just completed producing and directing the epic nonfiction documentary film Oh My God, which explores people’s diverse opinions and perceptions of God. Peter resides in Los Angeles with his wife and children.